If it moves, barcode it! Our barcoding efforts have been geared towards immediate practical needs rather than the wholesale adoption of technology by the organisation. We might have proceeded somewhat differently if we had acted strategically and attempted to barcode everything in all the National Galleries of Scotland collections. On the other hand, if we had waited to get a consensus on that we might not have done anything at all! Our initial barcoding project was prompted by the installation of automated storage machines (Kardex) at the refurbished Scottish National Portrait Gallery in 2011, but it was also the final outcome of a drive to audit every item in the prints, drawings and photographs collections. These had previously been stored, mostly in modern solander boxes, in various locations around the Portrait Gallery, a Victorian gothic structure with spiral stone staircases leading to turret and attic store rooms. We never fully understood what was kept in these areas until we had to empty out the building in 2009. In the case of the prints and drawings the main issue at this point was the box numbering system that was then in use, although there was also doubt about whether the contents of each box were correctly recorded on our collections database, while in the case of the photography collection the main factor was that large chunks of the collection were not recorded in any way. The boxes in which the drawings were stored were labelled with a range of numbers corresponding to an obsolete object numbering system. In some cases the labels, which were pieces of cardboard slotted into metal label holders on the front of each box, had fallen out of the label holders and got lost. 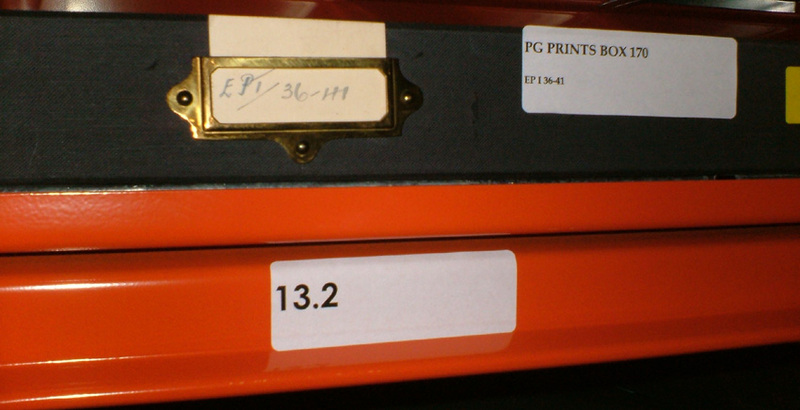 Similarly, each box of prints was labelled with a range of numbers corresponding to the accession numbers of the prints that were allegedly kept in the box. As the prints were not numbered sequentially but according to a complex system designed to record whether the print was Scottish, English or ‘Foreign’, the century in which the print was made and in some cases the coded identity of the sitter, this meant that a box might be numbered something like ‘SP IV 58.1 –150.6’. Some of the print containers had these numbers stencilled on them, often in gold, while others had cardboard labels in label holders as with the drawings boxes. 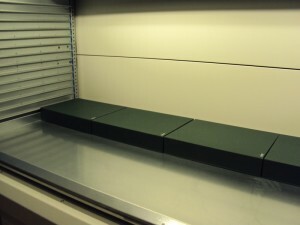 Once we moved all the boxes out of the Portrait Gallery, having added our own temporary box labels to help us place them on their new shelves in a sensible order and to record the locations on our database, the prints and drawings were stored in one temporary store and the photographs in another. Two projects got under way, one to audit the contents of the prints and drawings boxes and one to catalogue the remaining photographs. It was mainly because we didn’t want all this tidying up to be wasted that we pressed for all the boxes to be barcoded before their return to the Portrait Gallery. The fact that they were going to be stored in an automated retrieval system which could work with a barcode reader as its input device gave us a pretext to move forward with this. There was a short debate with curators and others about whether each item should be barcoded individually or not, and an even shorter debate about barcoding versus RFID tagging, the latter turning out to be one step too far. Read the real geeky stuff in part 2 – how they did it! Sheila Perry is Collections Information Systems Manager at the National Galleries of Scotland, based in the Registrars Department, with responsibility for maintaining and developing the NGS collections database and associated systems. Earlier in her career she was a programmer and database designer, and she writes mystery novels under a pen-name.